Buletin Veteriner Udayana, is a journal whose articles are reviewed by peer reviewers in the field of veterinary and animal science. The Buletin Veteriner Udayana is dedicated to publishing scientific articles in the field of veterinary medicine and related matters. Buletin Veteriner Udayana is expected to become the premier registration and documentation of scientific work, in addition to being a veterinary discussion area. The Buletin Veteriner Udayana should be able to ensure that all efforts made to publish scientific work have followed ethical rules of academics. Therefore we consider it is very important to equate the views of the stakeholders in a standard ethics in order to create a comfortable atmosphere and avoid the emergence of problems due to a conflict of interest in the future. This document is a policy statement taken by the Buletin Veteriner Udayana regarding the ethics of publication and malpractice to be used as a guide for stakeholders. The Buletin Veteriner Udayana holds firmly to the standard publication ethics for all who involved in the publication of scientific papers, including: authors, editors, reviewers, and publishers. Authors who do plagiarism are considered to behave disgraceful and less ethical. Authors are required to submit original works, not publishing them partially or fully to other journals, until the Buletin Veteriner Udayana gives an answer to the eligibility of the submitted article. Each name listed in the article should be qualified as an author. Each author must have made important contributions to the article written, such as concepts, design, data collection, data analysis, interpretation of data, and decision making. For those who play an important role in research but do not qualify as an author, his or her name can be listed in an acknowlegment. Corresponding author are responsible and ensure that those who play an important role in research, their name have been listed as an author. Also on behalf of the authors, the correspondence author should send a form (Form A) stating that they have fully accepted the last updated article and agreed to submit the article for publication. Peer reviewers are expected to play a role in giving inputs and assisting editors in adopting policies on articles reviewed in addition to helping authors improve the quality of their articles. The peer reviewers should inform the editors of their propriety and ability to review articles submitted to them. The entire article that is undergoing the editing process should be kept confidential. The editing process should be as objective as possible by reasoning, and not criticizing the author personally. The reviewers must have no personal interest in the research conducted by the researcher's, or research funders. If the article being edited is not eligible for publishing, the secrecy of the article should be maintained, so as not to be exploited by others without the permission of the authors. Editors are responsible and fully authorized to accept or reject a manuscript submitted by authors. Editors should not have a conflict of interest in accepting or rejecting a manuscript. In the process of editing the manuscript, the editors must be fair and objective. Assessment of a manuscript must be based on the scientific weight of the articles and regardless the ethnic, religions, racial, geographical origin, gender, citizenship and political views of the authors. The editors in accepting a manuscript should be based on the academic merit of the manuscript and not influenced by commercial interests. 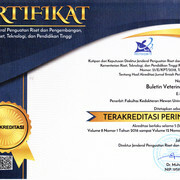 As a publisher of Buletin Veteriner Udayana, Faculty of Veterinary Medicine, Udayana University, in cooperation with veterinary profession organization, Indonesian Small Animal Veterinarian Practitioner Asociation and Indonesian Veterinary Medical Asociation in Region Bali, always encourages editors to comply with the commonly adopted scientific article writing practice. Publishers in collaboration with the authors, reviewers and the editors always maintaining the academic integrity during the publication process takes place. Publishers also maintain the quality of journals and encourage the development of journals in a better direction. The publisher will always ensure that the policy to publish or reject an article, based on the advice of the reviewers, and not influenced by commercial interests. The needs of a publishing business should not be at the expense of intellectual and ethical standards. Research involving experimental animals should be conducted in accordance with animal ethics and welfare. The animals should be well cared for and use as little as possible by minimizing the pain that may arise at the time of treatment. The use of experimental animals should be in accordance with local, national, and international rules. The authors must make a statement including the name of the ethical authority and the consent number, that the experiment has been carried out in compliance with animal ethics and welfare. by COPE (Committee on Publication Ethics) for policies that are not stated in this instructions.